Of the many toxic substances confronting the expert toxicologist, dioxins are among the most challenging. A scientifically credible toxicological assessment of a dioxin exposure must meet many requirements. The body of ongoing research is vast and there are a great many human epidemiological studies covering a wide range of potentially adverse health effects. Additionally, there are numerous remedial and regulatory guidelines setting precise limits for dioxins and dioxin-like compounds, some of which vary widely by state and locale. The positive impacts of environmental regulations, remediation and cleanup activities have greatly reduced the general dioxin burden in the U.S. The number of exposure-related cases has been decreasing steadily for the past few decades. However, dioxin exposures do still occur. This toxic exposure assessment summary provides a general toxicological review of TCDD and some of the many issues the expert toxicologist must consider when conducting a dioxin exposure and risk assessment. Note: Some of the demonstratives presented herein were used in past TCAS toxicological assessments and testimony. They are reproduced here in redacted form for educational and instructional purposes. No names or identifying information have been included due to privacy and legal considerations. Forensic toxicology applies scientific techniques and methodologies to assess and establish or refute causation based on objective evidence. To that end, it is extremely important to distinguish conjecture and assumptions from directly relevant objective evidence. For any given substance, the expert toxicologist must base toxicological findings upon the circumstances of exposure and the totality of generally-accepted, peer-reviewed scientific consensus. This scientific approach to assessment is guided by the fundamental steps of risk assessment; i.e. (a) data collection and evaluation, (b) exposure assessment, (c) toxicity assessment, (d) dose calculation and (e) risk characterization. However, in the case of dioxins, the objective evidence is not always crystal clear. There are varying opinions among toxicologists with respect to the underlying mechanisms by which dioxins cause the many health effects attributed to them. There are also varying opinions with respect to dioxins' carcinogenic properties and their roles in tumor promotion especially at low exposure levels. This toxic exposure study does not attempt to resolve these varying opinions. Rather, it summarizes what we know today with reasonable toxicological certainty. Citations to relevant epidemiological studies, regulatory guidance and other materials have been included where appropriate. An extensive list of human dioxin exposure study summaries is also included for toxicological reference purposes. TCDD [2,3,7,8-tetrachlorodibenzo-p-dioxin] is a man-made substance belonging to the polychlorinated "dibenzo-p-dioxin" family of chemical compounds. TCDD has a very unique chemical structure. It has no known useful application or purpose. TCDD is characterized as "extremely toxic" and is classified as a "Group 1 Known Human Carcinogen" by the World Health Organization (WHO) and by the U.S. EPA. It can induce a wide range of adverse health effects (including cancer) when only very small amounts are present in the blood. Dioxin compounds (referred to as "congeners") vary with respect to the number and position of chlorine molecules. This characteristic determines the identifier and toxicity of each dioxin congener. For example, in the chemical name "2,3,7,8-tetrachlorodibenzo-p-dioxin," the "2,3,7,8" identifier refers specifically to the number and position of chlorine molecules in TCDD dioxin. The "key/lock" analogy in the demonstrative above is a reasonably accurate analogy of dioxin's chemical reaction in the human body. In order for any substance to activate specific protein receptors, it must be chemically compatible. The simpler the compound, the more likely that it can attach. TCDD is a very unique compound in this respect as its structure is highly amenable to protein attachment. TCDD is extremely fat soluble and accumulates in the body over time through bioaccumulation. It is not unusual for TCDD blood levels to increase over a period of decades. The increase can be significantly more in cases of long-term exposures and even hundreds of times higher in cases of extreme occupational or long-term chronic exposures. One part per trillion denotes one part per 1,000,000,000,000 parts or one part in 1012 (expressed as 1 x 10-12). This is equivalent to one drop of water (0.05 mL) added to 20 olympic-sized swimming pools (2,500 cubic meters). 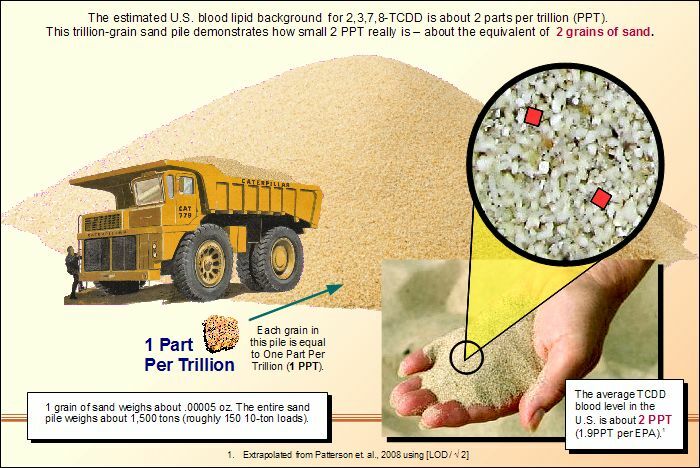 Measuring the difference between 2 and 20 PPT is similar to measuring the difference between 2 and 20 grains of sand in a trillion-grain sand pile. Such precise measurements are extremely difficult to achieve even using the very best high-resolution gas chromatography/mass spectrometry laboratory apparatus available. It is remarkable by any standard that such a tiny amount of a chemical substance can have such profound health impacts. The demonstrative below shows historical lipid-adjusted TCDD levels in North America by age group.1 The rises in TCDD levels are due primarily to environmental exposures from 1960 to 1980. The decreases in TCDD levels are due to decreased TCDD emissions from combustion sources, pesticides and cleanup and remediation efforts at CERCLA (e.g. "Superfund") sites. TCDD levels have also decreased due to improvements in food inspection and a wide range of product screening efforts that have been implemented over the past 40 years. The 1.9 PPT average background level is an estimate derived from the most recent U.S. National Health and Nutrition Examination Survey (NHANES). A review of the NHANES data reveals that the TCDD averages for every statistical group were below the average level of detection (LOD). The estimate is the result of taking the level of detection for TCDD as reported by the U.S. Center for Disease Control (CDC) and dividing by the square root of two. It is important to note that this represents a statistically-valid estimate in view of the broad scope and high degree of quality control in the NHANES database. The NHANES study conducted by the U.S. EPA validates many of the assumptions concerning dioxin blood levels in the general population. Since dioxins bioaccumulate in the body, minimization of intake is essential. TCDD has been the subject of many studies, but each study typically focuses on one particular aspect of health effects. Although there is no acknowledged "safe threshold" level for TCDD, it is generally accepted that the 1.9 PPT "background" level does not pose a significant health risk to the general population. It should be noted that U.S. EPA is proposing much tighter standards (still in process at the time of this writing). Soil and household dust are often the primary matrices of concern for transport of dioxin into the human body. Some 26 U.S. states and territories have established cleanup levels or regulatory guidelines for dioxin in soil. About 60 percent of these levels are expressed as TCDD, with the remaining levels expressed as dioxin TEQ. The demonstrative below (adapted from U.S. EPA's 2009 "Review of State Soil Cleanup Levels for Dioxin")2 illustrates the wide range of regulatory levels. For unrestricted/residential use, more than 75 percent of the values (20) fall at or below 120 PPT, and most (15) are less than 40 PPT. Ten (10) states have more aggressive cleanup levels of 10 PPT or less. For soil contaminated with dioxin, the exposure basis for unrestricted/residential cleanup levels is direct contact (with incidental soil ingestion as the key route of exposure). The World Health Organization (WHO) created a system for expressing dioxin congener toxicity which permits dose calculations based on a set of standardized toxicity values. 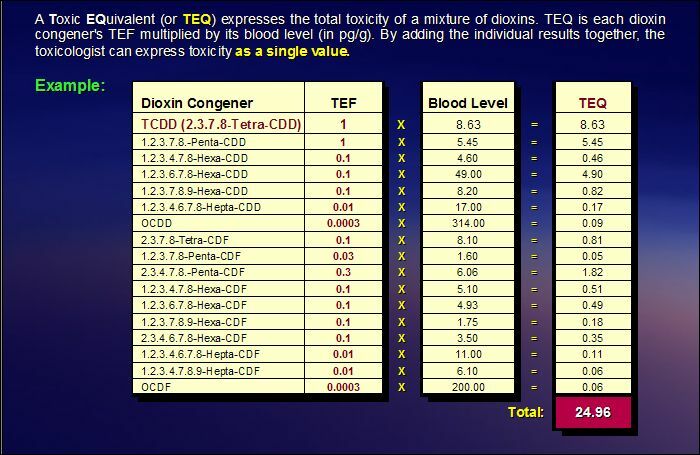 Toxic Equivalency Factors (TEFs) allow the toxicologist to objectively assess risk by rating dioxin congeners in terms of TCDD potency (TCDD has a TEF of 1.0, the highest toxicity). The WHO assigns specific toxicity ratings to different dioxin-like compounds for use in risk assessment. By applying the appropriate TEF to each dioxin congener, the expert toxicologist can calculate a Toxic Equivalent (TEQ) which expresses the total toxicity of a mixture of dioxins. The TEF rating system has been adopted by most countries including the United States, European Union, Canada, Japan and others. TEFs have been assigned by the World Health Organization to 29 different dioxin (or "dioxin-like") compounds consisting of 17 dioxins and dibenzofurans plus 12 PCBs. 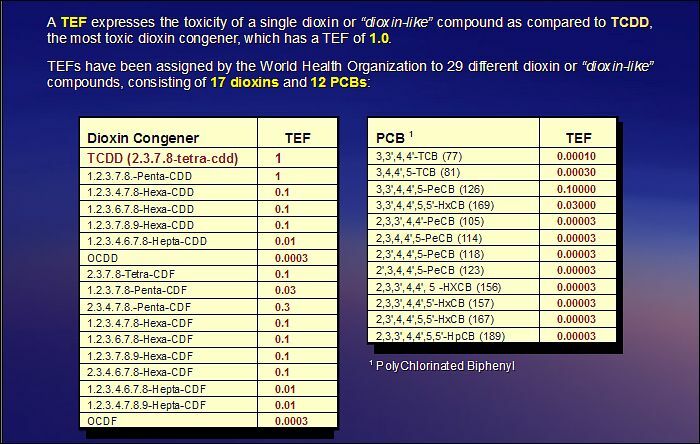 It should be noted that while the majority of laboratory reports produced for use by expert toxicologists typically include analyses for the 17 primary dioxin congeners, only some reports contain analyses for toxic PCB congeners (such as PCB-126). TEFs are appropriate for dioxin exposure assessments via the oral exposure route and via the dermal and inhalation routes as estimates (assuming exposures to dioxin-like compounds via these routes can be quantified). When included in a written assessment, the expert toxicologist must clearly identify the fractional contribution of oral, dermal and inhalation route exposures to the calculated dose(s) and the tabulation method used to arrive at the calculated totals. "Dioxins have the dubious distinction of belonging to the "dirty dozen" - a group of dangerous chemicals known as persistent organic pollutants. Dioxins are of concern because of their highly toxic potential. Experiments have shown they affect a number of organs and systems. Once dioxins have entered the body, they endure for a long time because of their chemical stability and their ability to be absorbed by fat tissue, where they are then stored in the body. Their half-life in the body is estimated to be seven to eleven years. In the environment, dioxins tend to accumulate in the food chain. The higher in the animal food chain one goes, the higher the concentration of dioxins." The dioxin family of compounds is vast and complex. There are three basic sets of chlorinated compounds with intrinsically similar chemical structures: (1) 75 different polychlorinated dibenzo-p-dioxins (PCDDs), (2) 135 different polychlorinated dibenzofurans (PCDFs) and (3) 209 different polychlorinated biphenyls (PCBs). Only some of the compounds in each group have been found to exhibit "dioxin-like" toxicity: 7 of the 75 PCDD compounds (i.e., those with chlorine substitutions in the 2,3,7, and 8 positions), 10 of the 135 PCDF compounds (i.e., those with chlorine substitution in the 2,3,7, and 8 positions) and 12 of the 209 PCB compounds (those containing 4 or more chlorines with 1 or no substitutions at the 2,2,6, or 6' positions). 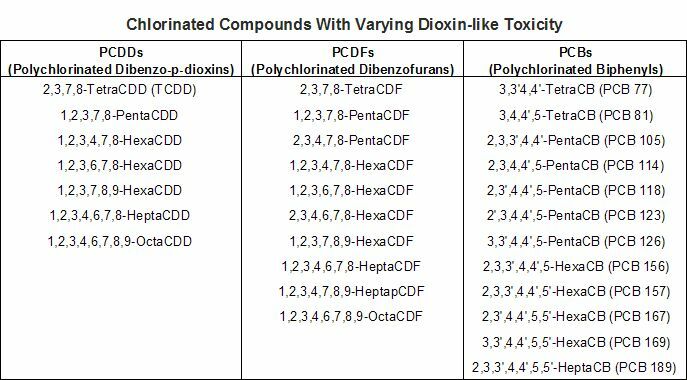 These 29 compounds are generally recognized and classified as possessing varying levels of dioxin-like toxicity as shown in the table below. Any single, unique, well-defined chemical compound in the dibenzo-p-dioxin or dibenzofuran group is termed a dioxin "congener." Each is based on a different number of chlorine atom substitution positions on the dibenzo-p-dioxin or dibenzofuran (TCDF) skeleton. Although there is general agreement that the 29 dioxin compounds (and 12 PCBs) characterized as toxic all have a similar mechanism of toxicity, not all are equally toxic. When the WHO toxic equivalency factors (TEFs) previously described are applied to each congener, the result is an additive dioxin dose expressed as TEQ. From this dose, cancer (and non-cancer) risk can subsequently be calculated. Only dioxin congeners and dioxin-like compounds with toxic properties (as supported by peer-reviewed studies) are typically cited when characterizing adverse health risks. Aside from the convenience afforded by working with a single value, TEQs are extremely important in toxicological assessments because they provide a uniform basis for risk assessment. By applying a fixed set of toxicity standards to dioxins, toxicologists can calculate dioxin toxicity through the application of a generally-recognized, peer-reviewed methodology. While differences of opinion may exist regarding the precise health effects and underlying mechanisms of dioxin congeners under varying circumstances and exposure levels, the method by which the dosages were arrived at is objective and, therefore, not subject to interpretation. Consequently, TEFs and TEQs are used by virtually every major health organization in the world today. CALUX is a bioassay measurement technique different from high resolution gas chromatography/mass spectrometry (HR-GC/MS) that directly measures the biological effect (activation of the aryl hydrocarbon receptor or Ahr) of dioxin-like compounds. Consequently, this method characterizes the toxicity of these compounds as a CALUX-TEQ. Thus, the CALUX technique has the advantage of providing a factual representation of a contaminant's impact on the human biological system as opposed to calculated values using traditional HR-GC/MS methodology. CALUX analyses are faster than HR-GC/MS and less expensive. In February 2008, the U.S. EPA published Method 4435 for screening for dioxin-like chemical activity in soils and sediments using CALUX. Data Collection and Evaluation: This is the process of gathering and analyzing site and geophysical data, historical facts, medical records, epidemiological studies, identification of cancer clusters and other pertinent information as well as identifying the chemicals of concern (COC) at the site of exposure. Exposure Assessment: This step defines the pathways of exposure (confirming or dismissing pathways as assessed) and estimates the magnitude, frequency and duration of dose. The result is a set of pathway-specific doses for current and future exposures to the chemicals of concern based on land-use assumptions. Toxicity Assessment: This step addresses (a) the adverse health effects associated with exposure, (b) the relationship between magnitude of exposure dose and adverse health effects, and (c) uncertainties such as the weight-of-evidence (WOE) of a chemical's carcinogenicity in humans. This is most frequently a two-step process consisting of (1) hazard identification which consists of research based on chemical-specific toxicity studies and the prevailing body of generally-recognized, peer-reviewed literature and (2) dose-response evaluation which quantitatively evaluates the toxicity relationship between dose and incidence of adverse health effects. Risk Characterization: The final step combines and summarizes the exposure and toxicity assessments to produce baseline risk estimates. Typically, the toxicologist presents his findings in both quantitative and qualitative statements in the form of a written report which compares chemical-specific toxicity data against measured contaminant exposure levels and exposure duration. Thus, central to a scientifically credible compilation of this evidential body of information is an understanding of the potential adverse health effects that can be attributed to dioxins. It is, therefore, worthwhile to briefly review what we know about TCDD's toxicity and the underlying chemical mechanisms which cause the adverse health effects attributed to dioxins. The U.S. EPA, the World Health Organization and many other regulatory agencies worldwide have characterized TCDD as "extremely toxic." Toxicity measures the relative degree of harm caused by an equivalent dose (or quantity). The dose of a substance ingested, inhaled or absorbed produces a measurable response which is called a "dose-response relationship." As the dose increases, the magnitude of harm correspondingly increases. 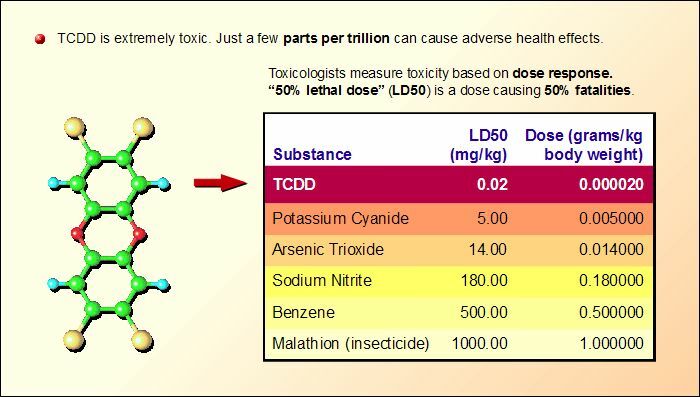 In animal screening evaluations, toxicologists frequently rate toxicity according to the "50% Lethal Dose" (or LD50) measurement. This defines how much of a substance will cause 50% fatalities in a population of test animals. LD50 is typically rated on the basis of a specific amount of a substance per unit of body weight (typically mg/kg). Unlike a "conventional" poison such as potassium cyanide (which causes rapid death by inhibiting the transport of oxygen in the blood), dioxins interfere with a basic genetic receptor system that regulates enzymes and other proteins. Thus, TCDD causes its systemic damage at the genetic transcription level. Adverse health effects in humans can take years or even decades to manifest. This frequently misunderstood point is central to understanding the toxicological challenges of characterizing risk from various dioxin congeners (of which TCDD is merely one). Genetic Effects: Vezina, Walker, et al., "Subchronic exposures to TCDD, PeCDF, PCB126 and PCB153: Effect on hepatic gene expression," November 2004, Environmental Health Perspectives, Vol. 112(16), pages 1636-1644. Non-Hodgkin's Lymphoma: DeRoos, et al., "Persistent organochlorine chemicals in plasma and risk of non-Hodgkin's lymphoma," 2005, Cancer Research, Vol. 65(23), pages 11214-11226. Immune System: Holsapple, MP, et al., "A review of 2,3,7,8-tetrachlorodibenzo-p-dioxin-induced changes in immunocompetence: 1991 update," 1991, Toxicology, Vol. 69, pages 219-255. Endometriosis: Hellier, JF, et al., "Increased dioxin-like compounds in the serum of women with peritoneal endometriosis and deep endometriotic (adenomyotic) nodules," August 2005, Fertility and Sterility, Vol. 84(2). Cancer: More than 38 studies. Refer to Peer-Reviewed TCDD/Dioxin Studies section. Diabetes: Lee, Duk-Hee, et al., "A strong dose-response relation between serum concentrations of persistent organic pollutants and diabetes," 2006, Diabetes Care, Vol. 29(7), pages 1638-1644. The evidence for TCDD carcinogenicity is overwhelming. 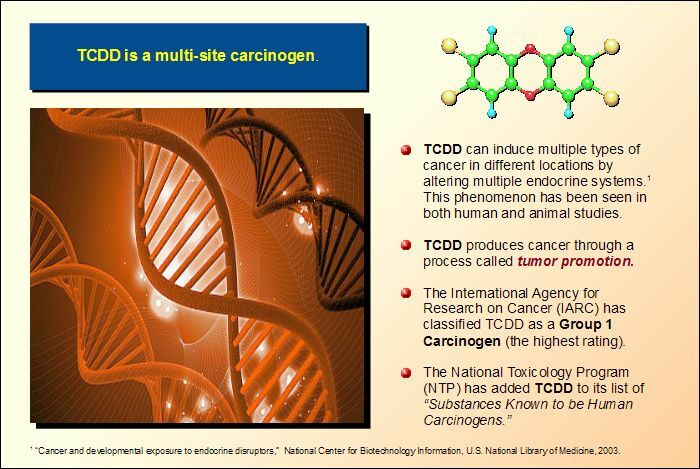 A multi-site carcinogen, TCDD can induce multiple types of cancer in different locations in the human body. 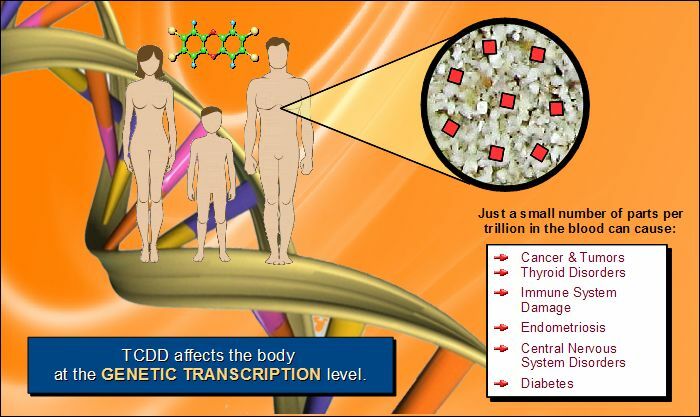 TCDD produces cancer through a process called "tumor promotion" in which the descendents of a single initiated cell damaged by a carcinogenic substance survive and expand in number. Each subsequent generation passes along the damaged DNA replication instructions to its clones. This phenomenon has been repeatedly observed in both human and animal studies. The carcinogenic characteristics of TCDD initially came to public attention when adverse health effects were related to the presence of TCDD in the herbicide Agent Orange, used as a defoliant during the Vietnam War. Public awareness increased in 1976 when an accidental dioxin release from a chemical manufacturing plant in Seveso, Italy, resulted in the highest known exposure to TCDD in a residential population ever. This event resulted in numerous scientific studies and eventually led to standardized industrial safety regulations. 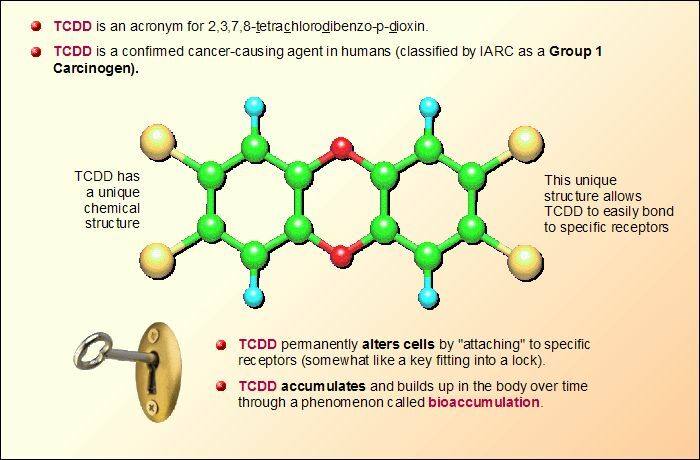 Subsequently, the International Agency for Research on Cancer (IARC) has classified TCDD as a "Group 1 Carcinogen" (the highest rating) and the National Toxicology Program (NTP) has added TCDD to its list of "Substances Known to be Human Carcinogens." The U.S. EPA is presently compiling a dioxin reassessment which further confirms these classifications. Links to certain types of cancers, diabetes and other health effects are still being investigated. TCDD involves highly complex micro-chemistry at the genetic level. Medical science still does not fully understand how TCDD causes its adverse health effects. "The [P]CDDs include 75 individual compounds; [P]CDFs include 135 different compounds. These individual compounds are referred to technically as congeners. Likewise, the BDDs include 75 different congeners, and the BDFs include an additional 135 congeners. Only 7 of the 75 congeners of CDDs or of BDDs are thought to have dioxin-like toxicity: those with chlorine/bromine substitutions in, at a minimum, the 2, 3, 7, and 8 positions. Only 10 of the 135 possible congeners of CDFs or of BDFs are thought to have dioxin-like toxicity; also those with substitutions in the 2, 3, 7, and 8 positions. This suggests that 17 individual CDDs/CDFs and an additional 17 BDDs/BDFs exhibit dioxin-like toxicity." U.S. EPA, Exposure and Human Health Reassessment of 2,3,7,8-Tetrachlorodibenzo-p-Dioxin (TCDD) and Related Compounds, 2012. The results of the exposure assessment will ultimately be applied to a scientifically credible risk characterization. Depending on the circumstances and nature of the exposure, the amount of information confronting the toxicologist may be enormous. Information compiled during the data collection and evaluation phase may run to hundreds or even thousands of pages. The procedures for reducing this massive compilation into a concise set of data varies with every exposure, but brevity is a virtue in such cases. Nonetheless, this toxic exposure study can only briefly touch upon some of the key points which the toxicologist must concisely address to present a comprehensive set of findings in a formal exposure assessment. 2,3,7,8-TCDD is typically not the only substance present in a dioxin exposure scenario. Humans are more likely to be exposed to highly variable distributions of multiple dioxin congeners, dibenzofurans and dioxin-like substances. These can enter the body from any of several sources and pathways of exposure. The demonstrative below is a simplified version of a complex scenario. However, the key point is that, from a toxicological perspective, these exposure pathways are additive. In practice, exposure pathways can occur in a variety of ways. For example, contaminated soil/dust can be inhaled, touched or ingested (as can smoke). Water contaminated with dioxins can be absorbed through the skin, ingested, used in food, etc. TCDD is present in most animal fats as the primary source of background dioxins in humans. Undoubtedly, the precise exposure pathways and circumstances are different in nearly every case. Widespread background contamination is typically a vastly different scenario than a localized acute dioxin release. For example, a chemical spill or industrial accident restricted to a small area would result in fewer exposure pathways. 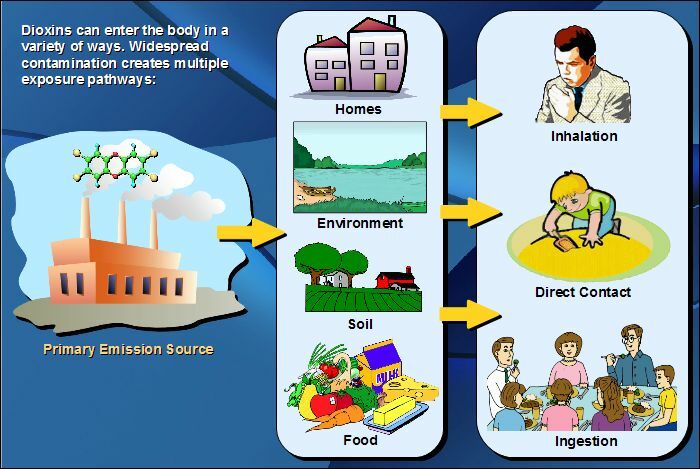 However, in the case of widespread contamination or chronic exposures, multiple (additive) exposure pathways do exist and are well documented (as confirmed in the Total Exposure Assessment Methodology [TEAM] produced by the U.S. EPA). Background levels in the U.S. have been extensively assessed and confirmed with NHANES blood lipid analyses as discussed below. Thus, to accurately assess the cumulative TCDD body burden and perform the necessary dose calculations, the expert toxicologist must closely adhere to a set of generally-accepted, peer-reviewed toxicological assessment methodologies. Dosage can only be established by assessing each exposure pathway and applying its appropriate additive dosage. These calculations should be fully documented in the assessment report and compared with background levels and dosages from multiple exogenous sources. Comparing background levels to blood dioxin levels in an exposed population is an important aspect of exposure assessment. The expert toxicologist must assess the mixture of dioxins with respect to both quantity and potency to provide an accurate assessment of potential health impacts. Only dioxins deemed as having toxic properties are assessed on the basis of TEQ and only those health effects strongly supported by peer-reviewed studies are typically cited in a risk or causation assessment. However, comparison of dioxin congener profiles and exposure levels to background levels provides an objective perspective and can sometimes reveal an exposure pattern in a population. The U.S. National Health and Nutrition Examination Survey (NHANES) provides important toxicological reference data in a dioxin exposure assessment. NHANES data is designed to provide reference ranges for blood levels of chemicals (including dioxins) from the mean up to the higher percentiles (75th, 90th, 95th) measured in the U.S. population. It is important to note that the cross-section of the U.S. population assessed by NHANES does not remove geographical locations that potentially include Superfund or hazardous waste sites nor does it exclude individuals with potential occupational exposures. Outliers are typically normalized as part of the overall NHANES data reduction process. Thus, toxicologists generally regard the NHANES published blood level for a given percentile as a reliable "true average" for that statistical group. The ATSDR (CDC) specifically uses the NHANES reference ranges for dioxin-like compounds to determine whether a blood dioxin level falls at or above the 95th percentile. Such a level constitutes an "unusual exposure." 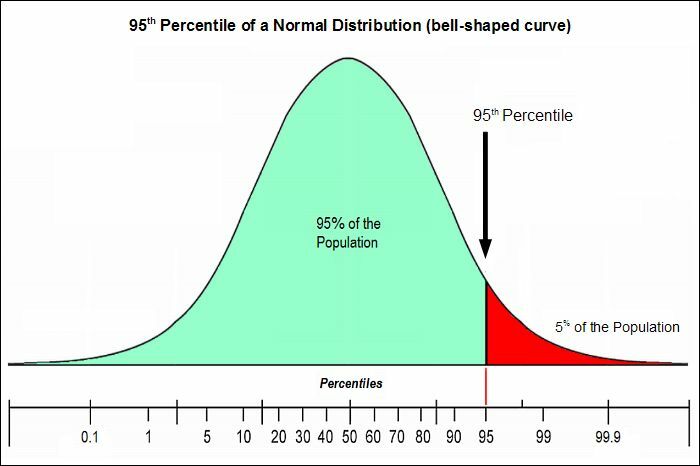 The Unusual Exposure Point (UEP) is universally defined by the scientific community as the boundary of the 95th percentile (as shown in the demonstrative below). There is a great deal of scientific reasoning behind this practice. It can be found in virtually all scientific literature, studies and research published in the past 50 years. It is also a uniform benchmark commonly applied in toxicological assessments and can play an important role in forensic matters. Applying this basic statistical concept to an exposed population allows the toxicologist to assess the probability of an unusual exposure. For example, statistics tell us that in any given population, only 5% should exhibit blood dioxin levels at or above the 95th percentile. If the percentage of exposed residents with blood levels exceeding the NHANES 95th percentile is substantially higher than 5%, this may be construed as indicative of an unusual exposure. The same statistical principle can be applied on an individual basis. For example, if a person's blood dioxin level is significantly below the 95th percentile for a dioxin congener identified as a potentially causative factor in an exposure case (such as TCDD), this may be interpreted as refuting an unusual exposure. However, other dioxin congeners may be elevated and these must also be assessed as part of the totality of exposure and (subsequently) risk characterization. It should be noted, however, that human epidemiological dioxin studies (see Appendix) have demonstrated statistically significant increased rates of certain malignancies (such as non-Hodgkins lymphoma) and certain non-cancer health effects occuring with 95% confidence at blood dioxin levels with percentile increases less than 95%. Thus, it is not acceptable to rule out increased risk of disease at blood lipid levels below the 95th percentile. Risk characterization summarizes the analyses of hazard, dose-response and exposure assessment and presents the extent and weight of evidence. An objective risk characterization applies specific guidelines to summarize the preliminary assessments. It identifies major points of interpretation and rationale for their selection and strengths and weaknesses of the evidence. Additionally, it considers alternative conclusions and uncertainties deserving of toxicological consideration. An accurate characterization of risk from dioxin and dioxin-like compounds requires concise integration of complex data sets and the application of specific formulae to calculate cancer risk and/or non-cancer endpoints. The toxicologist must consider and account for exposure hazards, mode of action, dose response and exposure. Incremental exposures from food and local sources must also be taken into account as well as risks to both the general population and special populations (children, subsistence fishers, etc.). Both carcinogenic risks and non-cancer risks must be addressed as appropriate to the dioxin congeners present in laboratory measurements and qualified by known rates of error. Finally, a comprehensive risk characterization must provide copious citations to peer-reviewed human exposure and epidemiological studies that validate both the qualitative and quantitative findings. Thus, it is the role of the expert toxicologist to assess a mixture of dioxins in a given exposure with respect to potency and provide an accurate assessment of the potential health impacts. The assessment methodology is based on the guidelines published by the U.S. EPA and other regulatory agencies. The procedures for calculating dose, exposure intervals, pathways and other factors must be arrived at by pragmatic application of these generally-recognized, peer-reviewed analytical methods. In most dioxin exposure scenarios, the exposed population consists of various sub-groups defined by age, duration of residency, proximity to the dioxin release and a variety of other factors. Each sub-group will experience a different risk level based on the calculated dioxin dose rate for that group. Average lifetime dose is generally calculated over a 70-year life expectancy. The toxicologist must provide separate estimates for each exposed group. Young children may be of particular concern in this regard (depending on the mode of action). Childhood is a susceptible period and exposures during childhood are not regarded as equivalent to exposures at other times; thus, such exposures are treated differently from exposures occurring later in life. U.S. EPA publishes Supplemental Guidance to assess risks from early-life exposure to potential carcinogens.5 It is also important to identify any occupational exposures that may have occurred among any individuals in a group as these must be treated separately in calculating both ingestion dose and cancer risk. The toxicologist applies the calculated dioxin dose to a potency factor referred to as a "slope factor." This is a unitless value which approximates a 95% confidence limit of increased cancer risk from a lifetime exposure by ingestion or inhalation. Also referred to as "cancer potency factors," slope factors are most appropriate for use in the low-dose region of the dose-response relationship. This method of cancer risk calculation is based on an assumption of "no threshold" carcinogenicity; i.e. there is assumed to be essentially no level of exposure that does not pose some probability of producing a carcinogenic response. This means that there is no specific dose above background that can be considered to be risk-free. This is the generally-accepted toxicological method for assessing cancer risk from dioxins. An important focus at the present time is the manner in which tumor promotion is triggered. If TCDD's carcinogenic dose-response characteristic is linear at low levels, even the 1.9 PPT background level might represent a true risk. If the dose-response is of a threshold-type, there is little or no risk at levels below the threshold. However, peer-reviewed human epidemiological studies have failed to identify a cancer threshold for dioxins (see Becher et al., 1996, DeRoos, et al., 2005 and other citations in the Appendix that found increased cancer risk at levels approaching background). There is general consensus among regulatory agencies and toxicologists that there is no "safe threshold" dose of TCDD above the average background blood level (approximately 1.9 parts per trillion in the U.S.). 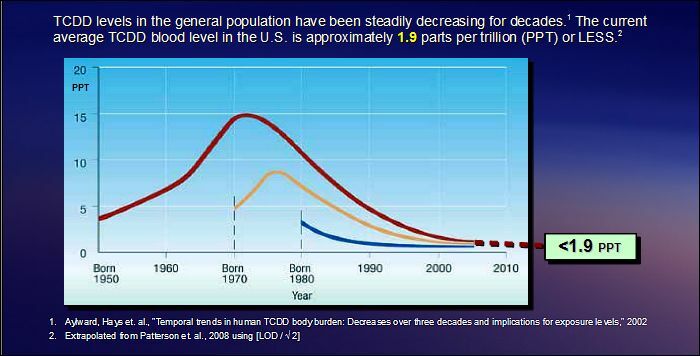 Older people tend to have more TCDD in their blood due to bioaccumulation and (as previously noted) the overall levels of dioxin in the U.S. population have been steadily descreasing over time. A 2003 Princeton University study concluded that there is "...no evidence for or against the proposition that dioxin is a threshold carcinogen." However, multiple recent peer-reviewed studies show significantly increased rates of non-Hogkins lymphoma (NHL), diabetes, endometriosis and other disorders at blood levels below the 95th percentile levels in the U.S. population.6,7,8 Thus, significant health risks do appear to exist at current exposure levels in the upper percentiles of the U.S. population, sometimes at levels below the 95th percentile. Bertazzi, PA, et al, "Ten-year mortality study of the population involved in the Seveso incident in 1976," June 1989, American Journal of Epidemiology, Vol. 129(6), pp. 1187-1200. Bertazzi, PA, et al, "Health effects of dioxin exposure: a twenty-year mortality study," June 2001, American Journal of Epidemiology, Vol. 153(11), pp. 1031-1044. Kerr, et al, "Parental occupational exposures and risk of neuroblastoma: a case-control study," 2000, (United States). Cancer Causes Cont. Vol. 11(7), pp.635-643. Akhmedkhanov, A, et al, "Characterization of dioxin exposure in residents of Chapaevsk, Russia," 2002, Journal of Exposure Analysis and Environmental Epidemiology, Vol.12, pp. 409-417. The mean concentration of total dioxin WHO - TEQ based on PCDDs, PCDFs and PCBs was 61.2 (range 16.4-168.1) pg/g lipid which was substantially higher than in non-occupationally exposed populations. Aronson KJ, et al, "Breast adipose tissue concentrations of polychlorinated biphenyls and other organochlorines and breast cancer risk," January 2000, Cancer Epidemiology, Biomarkers and Prevention, Vol. 2, pp. 55-63. The ORs were above two in the highest concentration categories of PCB congeners 105 and 118, and the ORs for these PCBs increased linearly across categories. Brown, NM, et al, "Prenatal TCDD and predisposition to mammary cancer in the rat," 1998, Carcinogenesis, Vol. 19, No. 9, pp. 1623-1629. Prenatal TCDD treatment resulted in an increased number of chemically induced mammary adenocarcinomas in rats. Charlier, CJ, et al, "Polychlorinated biphenyls contamination in women with breast cancer," 2004, Clinica Chimica Acta 347, pp. 177-181. The relationship between PCB concentrations in serum and risk factors mainly due to serum levels of PCB153 which were significantly higher in breast cancer women than in disease-free subjects (1.63 +/- 1.26 ppb vs. 0.63 +/- 0.78 ppb, p<0.0001) even after accounting for other potential risk factors. Demers, A, et al, "Plasma concentrations of polychlorinated biphenyls and the risk of breast cancer: A congener-specific analysis," 2002, American Journal of Epidemiology, Vol. 155, No. 7, pp. 629-635. Associations were found between breast cancer risk and either PCB 118 (OR = 1.60, 95% CI: 1.01, 2.53; fourth vs. first quartile) or PCB 156 (OR = 1.80, 95% CI: 1.11, 2.94, fourth vs. first quartile) concentration. Falck, F, Jr., "Pesticides and polychlorinated biphenyl residues in human breast lipids and their relation to breast cancer," March/April 1992, Archives of Environmental Health, Vol. 47 No. 2, pp. 143-146. Elevated levels of polychlorinated biphenyl 1,1,1 trichloroethane were found in fat samples from women with cancer compared with those who had benign breast disease. Hardell, L, et al, "Increased concentrations of octachlorodibenzo-p-dioxin in cases with breast cancer - results from a case-control study," 1996, European Journal of Cancer Prevention, Vol. 5, pp. 351-357. Mean concentrations of OCDD were 598 (170-14,880) and 396 (103-1,847) pg/g lipid in the cases and in the controls respectively. Mean concentration of TCDD in the cases was 3.6 (1.0-7.9) and in the controls 3.3 (1.1-6.3) pg/g lipid. Warner, M, et al, "Serum dioxin concentrations and breast cancer risk in the Seveso Women's Health Study," July 2002, Environ. Health Perspectives, Vol. 110, No. 7, pp. 625-628. Cox proportional hazards modeling showed that the hazard ratio for breast cancer associated with a 10-fold increase in serum TCDD levels was significantly increased to 2.1 pg/g (95% confidence interval, 1.0-4.6). Revich, BA, et al, "Effects of dioxins in the development of malignant tumors and disorders of reproductive health of the population," January-February 2002, Gigiena I Sanitariia, Vol. 1, pp. 8-13. In women, the morbidity and mortality due to breast cancer (RR 1.9 and 2.1, respectively) and cancer of the cervix uteri (RR 2.1 and 1.8, respectively) are increased. Reported a statistically significant increased risk ratio for chronic ischemic heart disease in Zone R, Seveso, Italy, from years 1976 - 1981 among male residents aged 20 - 74 years. Pesatori, AC, et al, "Dioxin exposure and non-malignant health effects: a mortality study," 1998, Occupational and Environmental Medicine, Vol. 55(2), pp. 126-131. Reported a significant increased risk ratio of chronic ischemic heart disease among Seveso, Italy, Zone A, male residents. Detected a highly significant increased rate of morality due to COPD for males residing in Seveso, Italy, Zone A, from 1976 - 1996. Reported a significant increased rate of COPD mortality among females residing in Seveso, Italy, Zones A and B, with 10 - 14 year latency. Similarly reported a significant increased rate of COPD mortality among females residing in Seveso, Italy, Zones A and B, with a maximal 20-year latency from 1976 through 1996. Also detected a significant increased rate of COPD mortality among males and females residing in Seveso, Italy, Zones A and B, with a maximal 20-year latency from 1976 through 1996. Reports a statistically significant increased mortality rate of COPD in males residing within Seveso, Italy, Zone A, dioxin exposures. Additionally detected a significantly increased mortality rate of COPD among females residing within Seveso, Italy, Zone B, with dioxin exposures. Bertazzi, PA, et al, "Health effects of dioxin exposure: a 20-year mortality study," 2001, American Journal of Epidemiology, Vol. 153(11), pp. 1031-1044. Calvert, GM, et al, "Evaluation of diabetes mellitus, serum glucose and thyroid function among United States workers exposed to 2,3,7,8-tetrachlorodibenzo-p-dioxin," 1999, Occupational and Environmental Medicine, Vol. 56(4), pp. 270-276. Detected a statistically significant increase in the average serum glucose concentration among 2,4,5-trichlorophenol workers with the highest dioxin extrapolated serum lipid levels. Henriksen, et al, "Serum dioxin and diabetes mellitus in veterans of operation ranch hand,"1997, Epidemiology Resources, Vol. 8, No. 3. Statistically significant increased relative risk ratios for diabetes among Vietnam veterans involved in "Operation Ranch Hand" and exposed to dioxin were reported. Also detected a higher proportion of oral medication use compared to controls among Vietnam veterans with dioxin exposures as part of Operation Ranch Hand. Lee, Duk-Hee, et al, "A strong dose-response relationship between serum concentrations of persistent organic pollutants and diabetes," 2006, Diabetes Care, Vol. 29(7), pp. 1638-1644. Diabetes prevalence was positively associated with lipid-adjusted serum concentrations of all 6 POPs. Adjusted ORs were 1.0, 14.0, 14.7, 38.8 and 37.7 (p for trend<0.001). Reported statistically significant increased rates of diabetes across the "25th, 25th to <50th, 75th to <90th and >90th" percentiles for heptachlorodioxin and other congeners and persistent organic pollutants (pg. 1641, Table 2). It should be noted that this study does not specifically report on the 95th percentile; rather, it relies upon the full range of blood dioxin and PCB levels. Longnecker & Michalek, "Serum dioxin level in relation to diabetes mellitus among air force veterans with background levels of exposure," 2000, Epidemiology, Vol. 11 (1), pp. 44-48. A statistically significant rate of diabetes was detected among Vietnam veterans with elevated serum dioxin concentrations ranging from 4.0 to < 5.2 pg/g following exposure during the U.S. Air Force Ranch Hand procedures. Pesatori, AC, et al, "Dioxin exposure and non-malignant health effects: a mortality study," 1998, Occupational and Environmental Medicine, Vol. 55(2), pp. 126-31. Reported an increased risk ratio (RR) for diabetes among Zone B females, Seveso, Italy (1976 - 1991). Steenland, K, et al, "Dioxin and diabetes mellitus: an analysis of the combined NIOSH and Ranch Hand data," 2001, Occupational and Environmental Medicine, Vol. 58 (1), pp. 641 - 648. Reported a highly significant (p<0.0001) increasing trend for diabetes prevalence with increased TCDD levels among Operation Ranch Hand veterans. A significant odds ratio was also detected with respect to the portion of the group with TCDD levels greater than 10 PPT. Pelclova, D, et al, "Lipid metabolism and neuropsychological follow-up study of workers exposed to 2,3,7,8-tetrachlordibenzo-p-dioxin," 2002, International Archives of Occupational and Environmental Health, 75 Suppl:S60-6. Heilier, JF, et al, "Increased dioxin-like compounds in the serum of women with peritoneal endometriosis and deep endometriotic (adenomyotic) nodules," August 2005, Fertility and Sterility, Vol. 84, No. 2. Logistic regression analysis indicated a significantly increased risk of deep endometriotic nodules (OR 3.3; 95% CI 1.4-7.6) for an increment of 10 pg in total TEQ levels/g lipids. An increased risk was also found for peritoneal endometriosis (OR 1.9; 95% CI 0.9-3.8) for total TEQ and for dioxins alone (OR 3.2; 95% CI 1.0-9.9). Louis, GMB, et al, "Environmental PCB exposure and risk of endometriosis," 2004, Human Reproduction, Vol. 20, No.1, pp. 279-285. Mayani, A, et al, "Dioxin concentrations in women with endrometriosis," 1997, Human Reproduction, Vol. 12, No.2, pp. 373-375. Measured the blood of 44 infertile women with endometriosis and 35 age-matched women with tubal infertility (control group). Eight women with endometriosis (18%) were dioxin positive as compared to one woman (3%) in the controls. (P=0.04). Bertazzi, PA, et al, "Ten year mortality study of the population involved in the Seveso incident in 1976," June 1989, American Journal of Epidemiology, Vol. 129(6), pp. 1187-1200. Ramlow, JM, et al, "Mortality in a cohort of pentachlorophenol manufacturing workers, 1940-1989," 1996, American Journal of Industrial Medicine, Vol. 30(2), pp. 180-194. Reported highly significant elevated SMRs and RRs specific to gastric or duodenal ulcers among workers with increased medium level hexachlorodioxin through octochlorodioxin exposures with 15-year minimum latency periods. Comparisons were statistically measured against the U.S. reference population. Provided a risk ratio (RR) comparison using Dow workers as a reference group. Presented evidence that the findings persisted throughout the overall pentachlorophenol-exposed cohort with or without allowance for a 15-year latency period, consistent with non-cancer acute toxicological effects. Conducted similar studies using low level hexachlorodioxin through octochlorodioxin exposures with 15-year minimum latency periods. Comparisons were statistically measured against the Dow workers as a reference group. Reported standard mortality ratios (SMRs) statistically measured against the U.S. reference population specific to gastric or duodenal ulcers among workers with low level TCDD exposures with 15-year minimum latency periods. Bertazzi, PA, et al, "Cancer incidence in a population accidentally exposed to 2,3,7,8-tetrachlorodibenzo-para-dioxin," 1993, Epidemiology, Vol. 4(5), pp. 398 - 406. 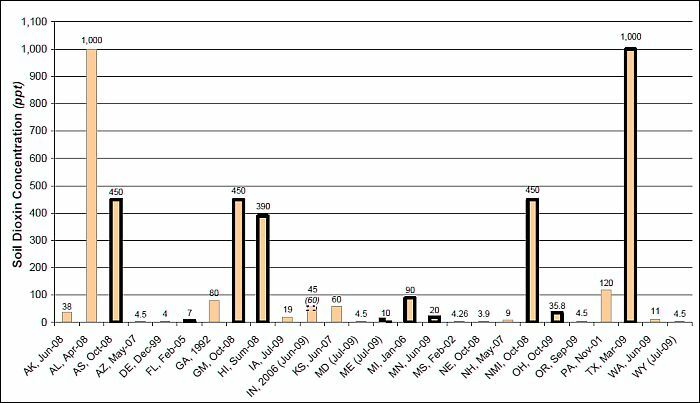 Reported an elevated rate of hepatobiliary malignancies among males and females residing within Seveso, Italy, Zone B, females for greater than five years. Bertazzi, PA, et al, "Health effects of dioxin exposure: a 20 year mortality study," 2001, American Journal of Epidemiology, Vol. 153(11), pp. 1031-1044. Reported the overall Hodgkin's mortality rate among male and female residents exposed to dioxins in Zones A and B, Seveso, Italy. A statistically significant increased rate was detected. Reported the mortality rate with 5 to 9 years of latency for males and females residing in Seveso, Italy, Zones A and B. A highly significant increased rate was detected. RR = 6.10 (95% CI: 1.4 - 27.5, p<0.05). Also reported the overall Hodgkin's mortality rate among male and female residents exposed to dioxins in the medium exposure area, Zone B, Seveso, Italy. A statistically significant increased rate was detected. Bertazzi, PA, et al, "Dioxin exposure and human leukemias and lymphomas: Lessons from the Seveso accident and studies on industrial workers," April, 1999, Leukemia, Vol. 13(1), pp. 572 - 574. Detected a highly significant increased Hodgkin's mortality rate among Zone B males with less than 10 years latency studied from 1976 through 1991. Also detected a highly significant increased mortality rate of Hodgkin's disease among Zone B females with greater than 10 years latency studied from 1976 - 1991. Reported the Hodgkin's mortality rate from 1982 through 1986 among male residents aged 20 to 74 years exposed to dioxins in the medium exposure area, Zone B, Seveso, Italy. A statistically significant increased rate was detected. 't Mannetje, A, et al, "Mortality in New Zealand workers exposed to phenoxy herbicide and dioxins," 2005, Occupational Environmental Medicine, Vol. 62(1), pp. 34-40. Birnbaum, Linda, "Workshop on perinatal exposure to dioxin-like compounds. V. Immunologic effects," 1995, Environmental Health Perspectives, Vol. 103(2), pp. 157-160. Holsapple, MP, et al, "A review of 2,3,7,8-tetrachlorodibenzo-p-dioxin-induced changes in immunocompetence: 1991 update," 1991, Toxicology, Vol. 69, pp. 219 - 255. Effects on the immune function have been demonstrated to be among the earliest and most sensitive indicators of 2,3,7,8-TCDD-induced toxicity. Effects of toxicity indicate that changes occur in innate immunity in addition to the changes in acquired immunity. Salvaggio, J & Sullivan, K, "Environmental Chemicals and the Immune System," in Mechanisms of Occupational Disease and Injury, pp. 69 - 88. Flesch-Janys, D, et al, "Exposure to polychlorinated dioxins and furans (PCDD/F) and mortality in a cohort of workers from a herbicide-producing plant in Hamburg, Federal Republic of German," 1995, American Journal of Epidemiology, Vol. 142(11), pp. 1165 - 1175. Detected a statistically significant relative risk (RR) of ischemic heart disease among male chemical plant workers in Germany with dioxin exposures. Mortality due to ischemic heart disease revealed a dose-dependant relationship. Hooiveld, Marietta, et al, "Second follow-up of a Dutch cohort occupationally exposed to phenoxy herbicides, chlorophenols and contaminants," 1998, American Journal of Epidemiology, Vol. 147(9), pp. 891 - 901. Male workers exposed to phenoxy herbicides or chlorophenols showed increased relative risks for ischemic heart diseases (RR = 1.8, 95%, CI 0.8 - 3.6) compared to non-exposed workers. Bertazzi, PA, et al, "Dioxin exposure and human leukemias and lymphomas: Lessons from the Seveso accident and studies on industrial workers," April 1999, Leukemia, Vol. 13, Suppl. 1, pp. 572-574. Reports that lymphatic and hematopoietic tissue is among the targets of the carcinogenic action of TCDD. Suggestive increases were seen for leukemia and multiple myeloma. Study reports a latency period of <10 years for leukemia has a RR=3.0, 95% CI 1.2-7.4; for >10 years, RR=3.4, 95% CI 0.8-14.5. Also indicates a length of stay of <1 year has RR=3.7, 95% CI 1.1-12.2, for 1 to 5 years RR=2.5, 95% CI 0.6-10.5, for 5 to 10 years RR=3.9 95% CI 0.9-16.5 with a total of RR=3.1, 95% CI 1.3-6.4. The increases in "hematopoietic neoplasms (particularly leukemia in males) did not appear to result from chance, confounding or information/comparison bias." The RR=1.98 (95% CI 1.25-3.13) for the referenced population as opposed to the entire region. Nearly fivefold increased relative risk for leukemias was apparent in the second quinquennium for males (RR=4.89, 95% CI, 1.1-21.0). Study states that TCDD acts as a promoter in the process of carcinogenesis. Bertazzi, PA, et al, "Dioxin exposure and cancer risk: a fifteen-year mortality study after the Seveso accident," 1997, Epidemiology, Vol. 8(6), pp. 646-652. Reported that hematological neoplasms were increased. The highest risks of leukemia were seen in the medium-level area, zone B, for men with 7 cases observed, 2.2 expected. (RR=3.1; 95% CI=1.3-6.4) and for women (RR=0.6, 95% CI 0.0-3.1). A latency period of less than 10 years was also significant (RR=3.0, 95% CI 1.0-7.0). Bertazzi, A, et al, "Cancer incidence in a population accidentally exposed to 2,3,7,8-tetrachlorodibenzo-para-dioxin," 1993, Epidemiology, Vol. 4(5), pp. 398-406. In the medium level area (Zone B), men experienced an increase in hematological neoplasms; women experienced an increased incidence of multiple myeloma (RR=5.3, 95% CI, 1.2-2.6) and myeloid leukemia (RR=3.7; 95% CI=0.9-15.7). Alavanja, MC, et al, "Mortality among agricultural extension agents," 1988, American Journal of Industrial Medicine, Vol. 14(2), pp. 167-76. Leukemia demonstrated a statistically significant linear trend with duration of employment as an extension agent. Significant excess for leukemia (PMR=1.80) and multiple myeloma (PMR=1.97). For lymphatic and hematopoietic cancers, 54 deaths observed versus 25 expected (PMR=2.16, 95% CI 1.69-2.77). Extension agents were, like farmers, exposed to excessive herbicides/pesticides. Lymphohematopoietic cancer mortality was increased in exposed production workers (SMR=1.65, 95% CI 0.53-3.85) especially for multiple myeloma (SMR=5.51, 95% CI: 1.14-16.1). No SMR given for leukemia. Pesatori, AC, et al, "Cancer in a young population in a dioxin-contaminated area," 1993, International Journal of Epidemiology, Vol. 22(6), pp. 1010-1013. Myeloid leukemia showed a clear, but not statistically significant increase (RR=2.7, 95% CI 0.7-11.4) in subjects aged 0-19 years in Seveso, Italy, between 1977-1986. Frumkin, Howard, "Agent Orange and Cancer: an overview for clinicians," July/August 2003, CA Cancer Journal for Clinicians, Vol. 53(4), pp. 245-255. Bertazzi, PA, "Industrial disasters and epidemiology," 1989, Scand. J. Work Environ. Health, Vol. 15, pp. 85-100. Preliminary results of the mortality study for the male population of the 3 zones of the contaminated territory in the Seveso area show leukemia with a RR=1.72, 95% CI 0.4-7.0. Fingerhut, MA, et al, "Cancer mortality in workers exposed to 2,3,7,8-tetrachlorodibenzo-p-dioxin," 1991, New England Journal of Medicine, Vol. 324(4), pp. 212-218. In both animal and epidemiologic studies, exposure to dioxin has been associated with an increased risk of cancer. Mortality from all cancers combined was slightly but significantly elevated in the overall cohort in this study (SMR, 115; 95% CI 102-130) and was higher in the sub-cohort with greater than or equal to one year of exposure and greater than or equal to 20 years of latency (SMR, 146, 95% CI 121-176). "Evaluation of a potential cluster of hematopoietic cancers among workers in a wood manufacturing mill in California," April 23, 1990, report of California Department of Health Services, Berkeley. States that a "statistically significant 16-fold increase in the acute leukemia rate and 7-fold excess for combined acute leukemia and non-Hodgkin's lymphoma rate were calculated. It could not be ruled out that this cluster could have happened by chance, though the probability of a chance occurrence is very low." Braun, WH, et al, "The pharmacokinetics and metabolism of pentachlorophenol in rats," 1977, Toxicology Applied Pharmacology, Vol. 41, pp. 395-406. Pentachlorophenol accumulates in tissues, particularly muscle, bone marrow and fat, where it does long-term damage to the formulation of blood cells. Vogel, CF, et al, "Pathogenesis of aryl hydrocarbon receptor-mediated development of lymphoma is associated with increased cyclooxygenase-2 expression," 2007, American Journal of Pathology, Vol. 171(5), pp. 1538-1548. 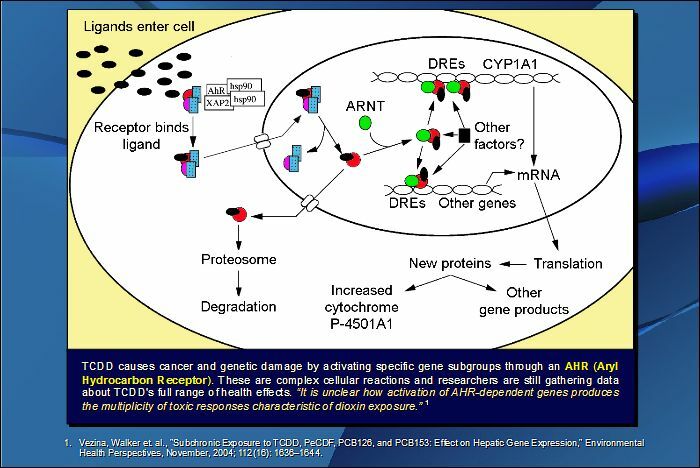 Activation of the aryl hydrocarbon receptor (AhR) by TCDD results in the loss of the programmed cell death (apoptosis) response in three different lymphoma cell lines which plays a key role in the development of cancer especially lymphoma and leukemia. Milham, S, "Study of mortality experience of AFL-CIO United Brotherhood of Carpenters and Joiners of America 1969-1970," 1974, DHEW Pub. No. 74-129, Springfield, VA, National Technical Information Service. Jappinen, et al, "Cancer incidence of workers in Finnish sawmill," 1989, Scand. J. Work Environ. Health, Vol. 15, pp. 18-23. Reports an excess of leukemia in both sexes (SIR 215, 95% CI 49-561 for males, SIR 273, 95% CI 56-797 for women) following exposure to chlorophenol products. Morton & Marjanovic, "Leukemia incidences by occupation in Portland-Vancover metropolitan area," 1984, American Journal of Industrial Medicine, Vol. 6, pp. 185-205. Risks of lymphatic and non-lymphatic leukemia were significantly elevated for lumber workers. Burkart, "Leukemia in hospital patients with occupational exposure to sawmill industry," 1982, West. J. Med., Vol. 137, pp. 440-441. Study references IARC report indicating a possible association between exposure to lumber and wood products industries and hematopoietic and lymphoreticular cancer implicating chlorophenols and phenoxy herbicides as possible causal agents. Detected a statistically significant increased risk ratio (rr) for cirrhosis of the liver among employees with medium cumulative TCDD exposures and 15 year latency. A control group of Dow Michigan employees was referenced. Mocarelli, P, et al, "Clinical laboratory manifestations of exposure to dioxin in children. A six-year study of the effects of an environmental disaster near Seveso, Italy," 1986, Journal of American Medical Association, Vol. 256(19), pp. 2687 - 2695. Residential exposure resulted in excess hepatobiliary cancer (2.8 times the normal). Bertazzi, et al, "Ten year mortality study of the population involved in the Seveso incident in 1976," 1989, American Journal of Epidemilogy, Vol. 129(6), pp. 1187-2000. Measured malignant melanoma mortality rates from 1976 through 1981 among 20 to 74 year-old male residents exposed to dioxins in the lowest exposure area, Zone R, Seveso, Italy. A very strong association was detected. Measured malignant melanoma mortality rates from 1976 through 1986 among male residents aged 20 to 74 years exposed to dioxins in the medium exposure area, Zone B, Seveso, Italy. A very strong association persisted. Studied malignant melanoma mortality rates from 1982 through 1986 among male residents aged 20 to 74 years exposed to dioxins in the medium exposure area, Zone B, Seveso, Italy. Again, a very strong association was detected. Bertazzi, PA, et al, "Cancer incidence in a population accidentally exposed to 2,3,7,8-tetrachlorodibenzo-para-dioxin," 1993, Epidemiology, Vol. 4(5) pp. 398-406. Reported an increased rate of MM among female residents of the medium level dioxin exposure area, Zone B, Seveso, Italy, from 1977 through 1986. Bertazzi, PA, et al, "Dioxin exposure and cancer risk: a 15-year mortality study after the Seveso accident," 1997, Epidemiology, Vol. 8(6), pp. 646-652. Also followed the rate of MM among male and female residents of Zones A & B, Seveso, also with statistically significant findings. Ericksson, M, et al, "Malignant lymphoproliferative diseases in occupations with potential exposure to phenoxyacetic acids or dioxins: a register-based study," 1992, American Journal of Industrial Medicine, Vol. 22, pp. 305-312. An increased standardized incidence rate (SIR) of 1.3 for multiple myeloma was verified in farmers. This finding applied to both sexes and the SIR increased over successive time periods. Reported the standardized mortality ratio (SMR) of NHL detected among employees exposed to phenoxy herbicides and dioxins. A highly significant SMR was reported among male employees. DeRoos, et al, "Persistent organochlorine chemicals in plasma and risk of non-Hodgkin's lymphoma," 2005, Cancer Research, Vol. 65(23), pp. 11214-11226. Measured the rate of NHL with respect to blood levels reported in the NHANES database. Specifically, the study detected an increase in NHL "with 35% increase per 10 TEQ pg/g lipid (95% confidence interval, 1.02 - 1.79)." Additionally, significantly increased NHL risks were detected with chlorodibenzofuran congeners across the quartiles. The study reports (page 11215) "Extreme exposures were characterized for each analyte as levels above the 95th percentile of the control distribution." At the extreme 95th percentile for 1,2,3,4,6,7,8-Hep-CDF in women, NHL rates measured 21.3 times in excess (OR, 21.3; 95% CI, 1.8-247). Hardell, L, et al, "Some aspects of the etiology of non-Hodgkin's lymphoma," 1998, Environmental Health perspectives, Vol. 106, (2), pp. 679-681. NHL has been associated with exposure to chemicals such as dioxins. Experimental evidence and clinical observations indicate that these chemicals may impair the immune system. Hardell, L, et al, "Higher concentrations of specific polychlorinated biphenyl congeners in adipose tissue from non-Hodgkin's lymphoma patients compared with controls without a malignant disease," 1996, International Journal of Oncology, Vol. 9, pp. 603-608. Garabedian, M, et al, "Occupational chlorophenol exposure and non-Hodgkin's lymphoma," 1999, Journal of Occupational and Environmental Medicine, Vol. 41(4), pp. 267-272. Cases with substantial chlorophenol exposure had a significantly greater number of years of chlorophenol exposure; however, the odds ratio for more than 7 years of substantial exposure was 1.51 (95% CI, 0.88 to 2.59). Overall, the findings do not provide strong support for an association with NHL risk. Reported the relative risk of lymphorecticulosarcoma among male residents exposed in Zone B, Seveso, Italy, from 1977 through 1986. A statistically significant rate was detected. Measured the rate of NHL among males and females residing within the lower exposure area, Zone R, Seveso, Italy, for greater than five years with the longest residency period. Reported the mortality rate following 15 to 20 years of latency for females residing in Seveso, Italy, Zones A and B. A highly significant increased rate of NHL was detected. Followed the mortality rate following 15 to 20 years of latency for males and females residing in Seveso, Zones A and B.
Rothman, et al, "A nested case control study of non-Hodgkin's lymphoma and serum organochlorine residues," 1997, Lancet, Vol. 350, pp. 240-244. Detected "a strong dose-response relation between quartiles of total lipid-corrected serum PCB concentrations and risk of non-Hodgkin's lymphoma overall." Specifically, page 241 of the study reveals that the blood values compared included "...the median value (10th, 25th, 75th and 90th percentiles)." The study did not even consider the 95th percentile value. Detected a highly significant increased rate of pleural cancer among Seveso residents of the low exposure region (Zone R) with an observation period from 1976 through 1981 among males. Studies the rate of pleural cancer among Seveso residents in the medium exposure region (Zone B) with an observation period from 1976 through 1981 among males. A highly significant excess was detected. Reported the risk ratio (RR) of renal cancer compared to a control group of Dow employees. Studies included high level cumulative hexachlorodioxin through octachlorodioxin exposures with 15-year minimum latency. Detected a significantly increased risk ratio among employees by cumulative TCDD exposure. A statistical trend test revealed a p-value of 0.04. Exposures included a minimal 15-year latency period. Seveso Zones A & B females with minimum 10-14 year latency since initial exposure (1976-1996). RR = 6.10 (95% CI: 1.8 - 20.4, p<0.05), females. Fingerhut, M, et al, "An evaluation of reports of dioxin exposure and soft tissue sarcoma pathology among chemical workers in the United States," 1984, Scand. Journal of Work Environ Health, Vol. 10, pp. 299-303. Hardell, L, et al, "Case -control study: Soft-tissue sarcomas and exposure to phenoxyacetic acids or chlorophenols," 1979, British Journal of Cancer, Vol. 39, pp. 711 - 717. Results show that exposure to phenoxyacetic acids or chlorophenols gave an approximately six fold increase in the risk for this type of tumor. Hardell, L, et al, "Malignant lymphoma and exposure to chemicals, especially organic solvents, chlorophenols and phenoxy acids: a case control study," 1981, British Journal of Cancer, Vol. 43, pp. 169-176. Exposures to chlorophenol herbicides in the lumber industry have been the principal cause of the increased risk of hematopoietic cancers. In this study, workers exposed to chlorophenols were found to have an eight-fold increase in soft tissue sarcomas and malignant lymphomas due primarily to PCP. Hoppin, J, et al, "Occupational chlorophenol exposure and soft tissue sarcoma risk among men aged 30 - 60 years," 1998, American Journal of Epidemiology, Vol. 148(7), pp. 693 - 703. Soft tissue sarcoma risk was significantly associated with ever having high-intensity chlorophenol exposure (OR = 1.79, 95% CI: 1.10 - 2.88). Greenlee, WF, et al, "Toxicity of chlorinated aromatic compounds in animals and humans: in vitro approaches to toxic mechanisms and risk assessment," 1985, Environmental Health Perspectives, Vol. 60, pp. 69-76. Describes studies on the mechanisms of action of TCDD in normal human epidermal cells and squamous cell carcinoma lines. Detected a highly significant increased rate of thyroid malignancies among Seveso female residents with medium-level exposure (Zone B) from 1982 through 1986. Heilier, JF, et aI., "Increased dioxin-like compounds in the serum of women with peritoneal endometriosis and deep endometriotic (adenomyotic) nodules," August 2005, Fertility and Sterility, Vol. 84, No.2. Lee, Duk-Hee, et al, "A strong dose-response relation between serum concentrations of persistent organic pollutants and diabetes," 2006, Diabetes Care, Vol. 29(7), pp. 1638-1644. Adapted from Minnesota Dept of Health, "Risk Assessment: Guidance for Dioxins"
"A dioxin assessment will only be regarded as scientifically reliable if it is based on generally-accepted scientific methods. Only in this manner can the toxicologist demonstrate or refute causation to reasonable toxicological certainty."